Art Basel opens in Switzerland following the launch weeks earlier of its first Asian edition in Hong Kong. 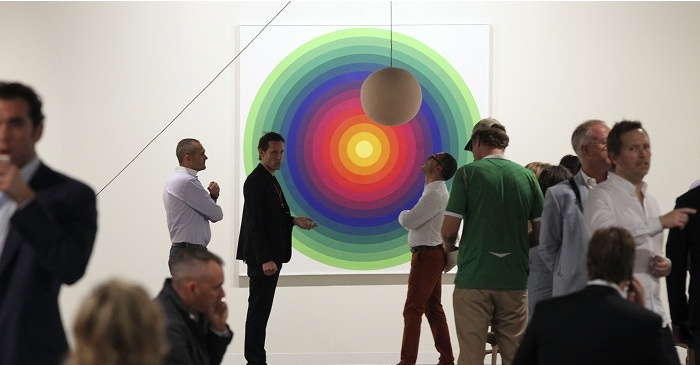 With Art Basel Miami Beach now in its tenth year, swissinfo.ch looks at the brand’s expansion and how experts view the change. “Every major art collector from Asia was in attendance,” Nick Simunovic, director of the Hong Kong branch of Gagosian, one of the world’s leading galleries, told swissinfo.ch. He believes the same would have been true of European collectors, had the Venice Biennale not come early this year and started only a week later (June 4), not to mention Basel following just after. He considers that Art Basel is so good at what they do, that they have made “the fair-going experience better” and attracted a robust mix of collectors from India, China, Japan, Korea and Australia. Simunovic pointed out however that Hong Kong lacked the frenzy of Basel and Miami where collectors arrive armed with the knowledge that allows them to make targeted purchases on the first day, if not in the first hours. With the intention of breaking into a new market, a number of young galleries have taken the plunge with Art Basel’s eastern expansion. She described with amusement how visitors with no interest in buying were nevertheless eager to understand the intentions of artists and how the artworks, especially the sculptures, were made. “This doesn’t happen elsewhere. I found their attitude very refreshing,” she admitted. Although it functions primarily as a market place, Art Basel has, over the years, developed a variety of peripheral activities meant to reflect all areas of contemporary creativity. Simon Lamunière was in charge of Art Unlimited at Art Basel for many years, before taking the reins of Art Geneva. Back from Hong Kong, he said that he found it striking how Art Basel has become a brand, with an over-riding identity that is stamped everywhere, much like Prada, when the fashion label opens a high-street shop. He witnessed, however, how nationalities appear to work independently of each other. “They operate like national microcosms,” he said, with Americans selling to Americans, Chinese selling to Chinese and the Australian galleries selling to Australians. Doesn’t that defeat the purpose of an international art fair, swissinfo.ch asked Florian Berktold, director of Hauser & Wirth, the renowned Swiss contemporary art gallery that has a showroom in Zurich, two in London and two in New York. “In a global market, it takes time to learn to read the other’s art. But when the Art Basel branding kicks in, it creates much more media power and communication, and attracts more curiosity,” he answered. 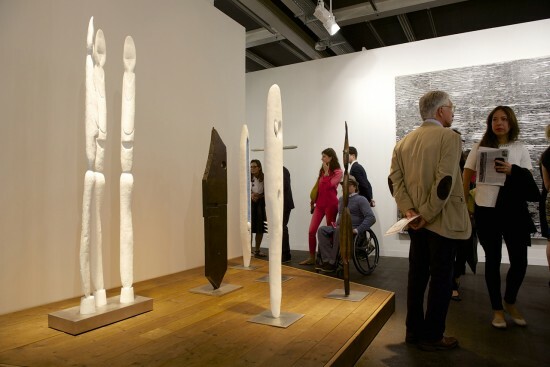 “Art fairs generate buzz and energy,” Berktold noted to explain why Hauser & Wirth, despite its own international clientele, is present in all Art Basel editions, as well as other prestigious international events. There are presently enough art fairs and biennales to fill a yearly calendar. But not all galleries have the means to participate and many young galleries are suffering as a consequence. Some are even disappearing, which was the case recently in Lausanne, when the well-respected Gallery Lucy Mackintosh gave up the struggle after nine years. Other galleries cannot access the official platforms despite numerous attempts: at Art Basel less than one in three galleries makes the grade. As a result, a plethora of alternative fairs takes place in parallel in Basel at the same dates, from June 10-16 (see infobox). As its 44th edition in Basel gets off to a start, the question remains of whether by casting its net further afield, Art Basel will dilute its strength, or on the contrary, reinforce its global position, making it even more difficult for young, adventurous galleries to survive. A stringent selection process means that out of 1,000 applicants, only 300 galleries are selected for Art Basel each year. To benefit from the concentration of an international art audience in the week of the official fair, satellite fairs take place at the same time. Now in its 18th year, Liste was originally intended to showcase galleries that are no more than five years old and present artists under the age of 40. The rules are now more relaxed, but only 66 galleries from over 300 applicants have been retained this year. 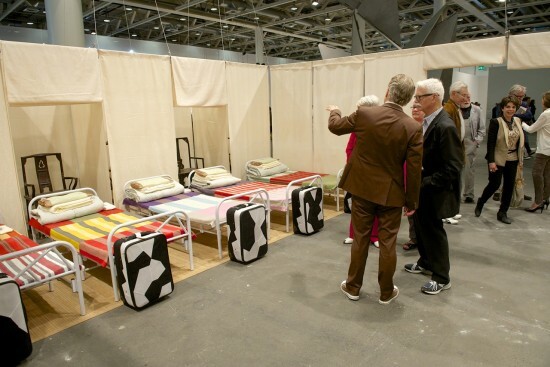 Because the jury is composed of curators, the selection is more conceptual than for the other satellite fairs. THE SOLO PROJECT show at St Jakob’s arena was set up by Paul Kusseneers in Antwerp for other established galleries, most of them European. The display, in a hostile-looking concrete environment, is actually singularly effective as the visit winds its way through a labyrinth of powerful solo exhibitions. Although an incubator for emerging work, Scope Basel is reputed for its elegance and sobriety. It features 75 exhibitors this year. Basel’s cutting-edge art fair for new and emerging art. The fair, which also organises a show in New York, favours single artist presentations or booth concepts with two artists. This edition includes 74 exhibitors from Europe, the Americas, the Middle East, South Africa and East Asia. Intended for graduates of a Swiss art or design college, federal prizes, presented for the first time together this year, are an interesting barometer of Swiss creativity.